Harvey Weinstein has earned himself a reputation for mercilessly and needlessly hacking up the foreign movies unfortunate enough to fall under his distribution in the U.S.; whether through Miramax or The Weinstein Company, he's gotten hands-on and snip-happy with pictures ranging from Bernardo Bertolucci's Little Buddha to Stephen Chow's Shaolin Soccer (among many others). 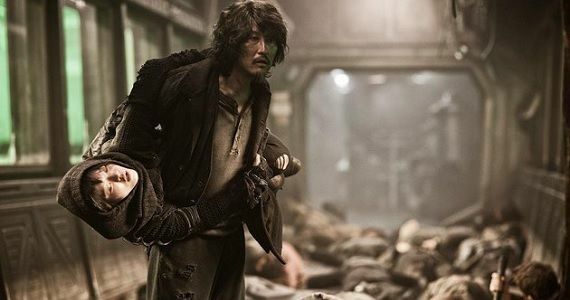 Most recently, it appeared as though South Korean filmmaker Bong Joon-ho's latest effort, sci-fi actioner Snowpiercer, was up next on Weinstein's chopping block, with the threat of a twenty minute cut looming over Bong's film (with regard to its U.S. theatrical release). Though their dispute looked a little touch and go for a while, a resolution has finally been reached and it's an artistic win for Bong: Snowpiercer will be hitting US theaters with its full two and a half hour running time intact. There's a conditional here, though, in that the film will no longer enjoy an initial wide release as originally promised, and will instead be given a platform release with a roll out. That seems like a reasonable trade, but it's a move that will certainly impact Snowpiercer's visibility among US viewers. The news comes to us by way of Deadline, though unfortunately the question of the film's release date still remains woefully unanswered. Whether this is the best possible outcome for Bong or a serious hit to his film's chances at success stateside depends on individual perspective; arguably, shaving Snowpiercer down to closer to two hours for a wider audience would be better than potentially keeping that audience from ever getting the chance to see it. But there are two significant points here worth considering. First, Snowpiercer has both been breaking records at home and enjoying some seriously enthusiastic reviews from those few critics fortunate enough to have seen it in its uncut glory; it stands to reason, then, that the film has a good chance of scoring raves from American journalists once it opens here and making an impact among cinephile crowds. If that happens, then The Weinstein Company can take advantage of early praise and box office success, funnel cash into a bigger marketing campaign, and make use the film's hype to raise awareness among a more mainstream audience. The second point, however, may be the most important: Bong gets to maintain his original vision for Snowpiercer and keep his movie intact. A victory for the filmmaker is one worth celebrating, though hopefully it doesn't lead to Snowpiercer getting buried in arthouse theaters in only major US cities. The film takes place in a future where Earth is in the grip of a new ice age that has wiped out most of humanity; the remainder of the world's population lives aboard the massive titular train, on which an oppressive class system has evolved - until a rebellion breaks out and a fight for control of the train's perpetual-motion engine ensues. It's difficult imagining Snowpiercer getting totally overlooked by casual moviegoers; the futuristic backdrop and plentiful action scenes (at least according to trailers) combined with the presence of The Avengers' Chris Evans, Oscar-winner Octavia Spencer, and Ed Harris alone should be enough to do respectable business amongst a broad viewer base, though the supporting cast (which includes Tilda Swinton, John Hurt, Alison Pil, Jamie Bell, and South Korean actors Song Kang-ho and Go Ah-sung) will likely speak more to dedicated fans than anyone else. We'll see how Snowpiercer fares once it opens in the US, though again, there's no word on when that will be just yet. Keep your fingers crossed. Snowpiercer has no US release date yet, but we'll keep you updated.